Thor is a movie that has been blessed with extremely positive reviews. It kicks off the summer movie season in grand fashion and is going to be well received movies this year. It is the story of the powerful but arrogant warrior Thor banished to Earth to learn humility. The warrior Thor is cast out of the fantastic realm of Asgard by his father Odin for his arrogance and sent to Earth to live among humans. Falling in love with scientist Jane Foster teaches Thor much-needed lessons, and his new-found strength comes into play as a villain from his homeland sends dark forces toward Earth. You download Thor to your computers as a backup and enjoy it time and time again. However, do you want to convert Thor to iPhone or iPad for sharing with your friends on the go? It must make you look more fashionable. In this article, I'll introduce you an efficient way to transcode Thro movie to iPhone iPad iPod on Mac with excellent output quality. 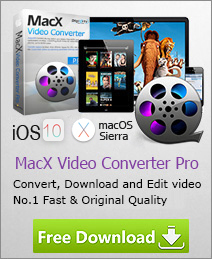 Take a look at this free Mac video converter named MacX Video Converter Free Edition. It can process almost all popular used videos like MKV, AVCHD, M2TS, AVI, MPEG, MP4, MOV, FLV to iPad/iPod/iPhone seamlessly in few clicks. Then you can enjoy the fun of videos you like on your portable devices anytime. After download Thor movie, run this free video converter for Mac and import source video by clicking Add File button. In the output format area, there are much more output video format to be chosen, such as iPhone, iPad, iPod, MOV, MP4, AVI, YouTube, etc. Click Browse button in output setting area and select a destination folder to save your converted video. Click Start button to start the conversion. You can view the conversion progress and are able to cancel the process at anytime. For those who would like to encode to more output formats with advanced functions, MacX Video Converter Pro would give a hand. It provides more output formats like iPhone XS/XR/X/8/7/6S/6, Samsung Galaxy S9/Note 8, Huawei Mate, etc. It also performs as website video downloader, easily download video from YouTube, Myspace, Metacafe etc. Furthermore, MacX Video Converter Pro Edition can create VOB files from video. You can burn your favorite videos to DVD for a backup. If you looking for free movie converter to rip DVD movies, try MacX DVD Ripper Mac Free Edition. This free movie converter Mac can easily rip DVD and convert it into a number of formats such as MP4, MOV, MPEG, FLV or iTunes which can be played on your Mac, iPhone, iPod, iPad or mobile phone.